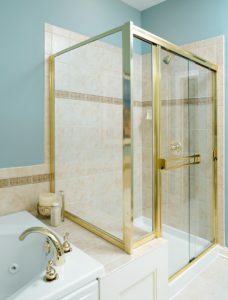 Functional, attractive bathrooms can affect your everyday life, and a new shower door can make a significant difference. If you want a traditional look, a framed glass shower door may be right for you and can help you get the bathroom you’ve always wanted. Our experienced craftsmen can install a variety of framed shower door styles and sizes. Whether your new shower door needs custom cuts or requires a specific type of glass, Mooney & Moses Insulation has all your needs covered in southwestern Ohio. Call 513-341-8918 or fill out a contact form to get in touch with us today and schedule your shower door installation! If you’re deciding what type of shower door to install in your home, you’re likely deciding between a traditional framed door and a frameless option. While some homeowners opt for frameless doors due to their sleek modern look, there are several benefits to choosing a framed shower door. When you call us, you can rest assured you’ve found a company who cares about your needs. Our top priority is ensure you get the best framed shower door—one that seamlessly complements your bathroom and meets your needs, stylistic preferences and budget! Why Choose Mooney & Moses Insulation for Your Shower Door Installation? We’ve been in the business for over 65 years. We have experience installing different types of shower doors and other home products. We’re part of the renowned Installed Building Products family of companies. Get in touch with Mooney & Moses Insulation today to learn more—call 513-341-8918 or contact us online! No matter your shower door needs, look to the Mooney & Moses Insulation team. We offer one of the most extensive selections in the Cincinnati area. All doors are locally manufactured with high quality materials in the area, and all are professionally installed by our team. Better yet, our framed shower doors are low-maintenance and provide years of beauty and reliability. Give us a call at 513-341-8918 or contact us online. We’re looking forward to working with you!